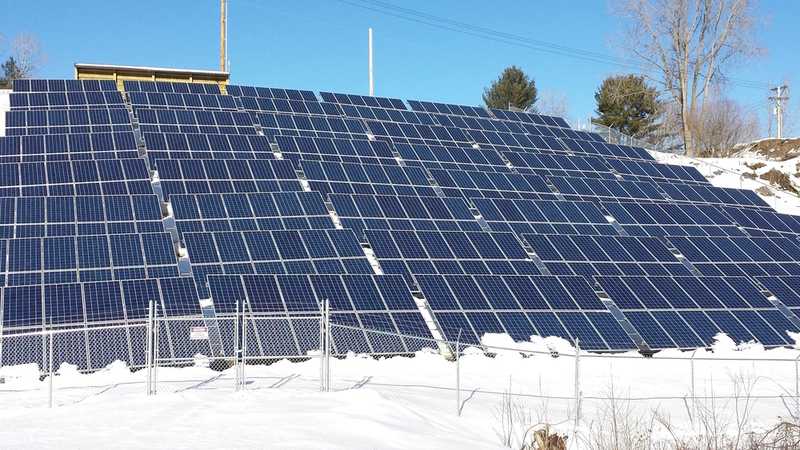 Last December the Town of Cavendish completed construction of a solar array to power municipal facilities. Town officials planned a simple celebration in February, but when the snow levels grew they postponed it to the spring. The Select Board and Energy Committee have now announced that the Grand Opening Celebration and ribbon-cutting event will occur on Monday, April 20th at 11:00 a.m. It will be held at the new Cavendish Municipal Solar Array site, which is located off Power Plant Road next to the wastewater treatment plant. All citizens and residents of Cavendish are invited to attend. After the ribbon cutting and remarks there will be a reception with light refreshments at the Cavendish Town Offices, 37 High Street in Cavendish. The solar array is designed to produce 148 kW of ac solar power as a net-metered system. The array feeds all generated electricity into the grid, and Green Mountain Power offsets that generated electricity against the electricity used by the Town offices, the transfer station, the water filtration plant and the wastewater treatment system.